If you've got a dog that you love, you probably want to take it with you everywhere you go. 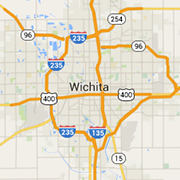 Fortunately for you, Wichita is home to several dog-friendly places. We spoke with representatives from several Wichita locations to confirm that they allow dogs, however, to avoid any discrepancy, you should always call ahead to verify that policies have not changed before bringing your furry friend with you. When you bring dogs to public locations, they should always be leashed and under your supervision. Just when we thought that Central Standard Brewing couldn't get any cooler, it does. Not only is CSB a great place to try a new craft beer, play lawn games and relax, it's also the perfect spot to visit with your doggies! Central Standard Brewing is very dog-friendly, allowing dogs both on the patio and inside. There are even water bowls on the patio, so your dog can enjoy a nice cold drink while you do, too! CSB offers a wide variety of tasty drinks including seasonal, Belgian, IPA, barrel-aged, sour and wild/Brett beers. CSB's beers are brewed using only the best ingredients available. You're also more than welcome to bring your dog on over to the Hopping Gnome Brewing Company! Located at 1710 E. Douglas Ave, Hopping Gnome offers a variety of high-quality craft beers, including selections of American, British, Belgian, German, and seasonal styles. The staff at the taproom and microbrewery takes pride in each new flavor they create. The Hopping Gnome offers a totally beer-focused atmosphere, so grab a few friends (or a few dogs) and check it out! Fetch Bistro opened in 2016 to bring a dog-friendly restaurant to Wichita. Greg and Pamela Buss, owners of Wichita's Egg Crate Cafe, opened the restaurant which welcomes dogs on and even features a section for dogs on its menu! The restaurant is the first in Kansas to welcome dogs inside. Not only is the restaurant 100 percent dog-friendly, it's dog-themed, too, to totally celebrate the joy of people and their pets! Located at 7718 E. 37th St. N., Fetch Bistro sits in the Siena Plaza Shopping Center. Fetch Bistro serves generous portions of both breakfast and lunchtime culinary delights. Next time you're on the east side, swing by and check it out! Perhaps the most surprising place on this list, Pottery Barn allows dogs in the store. A Manager at the Wichita location told us that they have a water bowl and will even give out dog treats with the owner's permission. Located at 2040 N. Rock Road, Wichita's Pottery Barn opened on October 26, 2016, making it the first in the state of Kansas. Pottery Barn is a national retailer of bed and bath products, furniture, home decor and more. The original Pottery Barn was located in lower Manhattan, opening in 1949. Lowe's stores have been known to allow pets by location, and according to the local representatives we spoke to, Wichita Lowe's locations allow you to bring you dog along while you shop. With locations at 333 S. Ridge, 11959 E. Kellogg Dr. S. and 2626 N. Maize Rd., you're never too far away. Lowe's is a great place to go for home improvement project supplies. The store carries appliances, building supplies, flooring, hardware, heating and cooling, home decor, lawn and garden supplies, paint, plumbing and much more. When you can't bring your dog inside, what's the next best thing? Having drinks on the patio together! Many Wichita establishments confirmed that they allow dogs outdoors, but again, you should always call to double-check! Here are some patios that will welcome your pup! Wichita's The Anchor is located at 1109 E. Douglas Ave. With a front patio that welcomes dogs, your dog will be able to experience the hustle and bustle of downtown Wichita first-hand at The Anchor. The Anchor is a downtown bar and grill with a laid-back and social environment.Known for its signature dishes like the Haystack, Chicken-fried pork loin, and more, you're sure to find something you'll love. The Anchor also highlights a large selection of drink including crafty cocktails, wine, spirits, and over 50 craft beers on tap. Though the west side Buffalo Wild Wings told us that they do not allow dogs on their patio, a manager at the restaurant's east location said that the east side location does allow leashed dogs on the patio. (You should still, as always, call ahead to verify before bringing your dog along). Located at 3236 N. Rock Rd., Buffalo Wild Wings specializes in well, wings. The restaurant offers 21 flavors of wings as well as a variety of burgers, sandwiches and wraps. Equipped with several flat screen tvs, it's a great place to catch a game (if you're dining inside, sans dog). "B-dubs", as the restaurant is also known, also offers a trivia game to play at your table while you wait! Nestled in Clifton Square, Dempsey's Burger Pub offers some of the best burgers around. Seriously, ask anybody. This is largely because Dempsey's staff believe in the importance of locally-sourced ingredients, offering burgers made from only the freshest, locally-grown products available. The restaurant has a front patio that offers a perfect place to soak up some sun on a nice day. Dempsey's Burger Pub allows dogs on the patio, too, so you can bring a furry friend along while you eat. If you've never visited Dempsey's Burger Pub, it's definitely worth checking out. The recently-opened Dempsey's Burger Pub counterpart, Dempsey's Biscuit Co. was met with rave reviews almost immediately. Though the restaurants have different menus, they have some things in common, sharing more than just their name. The locations also share their dogs-on-the-patio policy, according to a Dempsey's representative. Located at 3425 E. Douglas Ave., Dempsey's Biscuit Co. uses biscuits in every way you can imagine. Biscuit sandwich, biscuit french toast, biscuit BLT and so much more are available at Dempsey's Biscuit Co. With a variety of fried chicken menu options, too, Dempsey's Biscuit Co. redefines comfort food. Located at the intersection of Douglas and Hillside at 4800 E. Douglas, the Hill Bar and Grill has a front patio where you and your four-legged friend are welcome! The restaurant is open for both lunch and dinner during the week and offers brunch on the weekends. A diverse menu highlights wraps, sandwiches, burgers, tacos, spaghetti and meatballs and more. A large selection of drink options allow you to try something new each time you visit! You're in luck! Lucky's Everyday, located at 1217 E. Douglas Ave., offers a dog-friendly patio, too. Lucky's Everyday offers a unique blend of 1/3 dive bar, 1/3 hipster hang out and 1/3 venue, making it a really cool place to visit. Lucky's is open daily from 4 p.m. to 2 a.m., so it offers a great way for both you and your dog to spend an evening out socializing! Wichita's Monarch is home to one of the best patios in town, and your pup can experience it with you! Located at 579 W. Douglas Ave., Monarch is the blue building with the patio facing the Delano roundabout. The gastropub highlights flatbreads, soups, salads, sandwiches, plated meals and more on its food menu, and also offers both a drink menu and a bourbon menu. Located at 1144 N. Bitting, R Coffee House's patio is "absolutely" dog-friendly, a representative told us. R Coffee House offers an eclectic but relaxed atmosphere. If you've never visited, it's likely because this coffee house is hiding in the heart of the scenic Riverside district. The locally-owned joint loves to showcase the talents of Wichitans, hosting local musicians and even selling locally-made gifts! Stop by sometime and check out a variety of daily specials! Reverie Roasters, located in the Douglas Design District, offers a front patio where your dog is welcome to join you. The coffee roastery prides itself on offering great quality coffees that are roasted lightly, unlocking the full flavor potential of each bean. Specializing in sweet espresso and many other handcrafted coffee drinks, Reverie bottles its own cold brewed coffee to go. This one-of-a-kind roastery offers not only coffee, but also equipment, supplies and syrups. According to a number of reports online, Sonic Drive-In is dog-friendly, but this policy varies by location. As there are more than 20 Sonic locations in the Wichita area, we request that you contact your preferred location before bringing your pup to the outdoor tables. Sonic offers a variety of fast-food options including chicken, burgers, hot dogs, toasters and more. It's also a prime location to grab a soft drink, slush, or shake as it offers a wide variety of options and has regular drink specials. Wine Dive is located at 4714 E. Douglas Ave., offering another dog-friendly patio. As the name suggests, the folks at Wine Dive love wine and the restaurant features more than 350 bottles and 40 by the glass options to choose from. With separate menus for lunch, dinner, dessert and brunch, there's always a delicious new dish to try at Wine Dive! Wine Dive is open from 11 a.m. until 10 p.m. on Monday through Thursday, from 11 a.m. to 12 a.m. on Friday and Saturday, and from 10 a.m. until 9 p.m. on Sunday. Home to a popular patio in Clifton Square, Ziggy's Pizza is located at 3700 E. Douglas. A locally owned neighborhood pizza and sandwich pub, Ziggy's, too, welcomes dogs on its patio. Ziggy's offers a casual and fun dining atmosphere where you'll feel right at home. Specializing in handmade pizzas with made-from-scratch dough, Ziggy's also offers sandwiches, wings, salads and more. Ziggy's bar offers both local and national beers, wine and cocktails. Though dogs may not technically be allowed, a number of locations have been known to offer treats for dogs at the drive through window (sometimes they're even free!). Theses may also vary by location, though. Here are a few places that offer drive through dog treats. Freddy's Frozen Custard and Steakburgers - Freddy's locations usually offer a "Pup Cup", which consists of a small dish of frozen custard with a dog bone on top. Intrust Bank - Intrust Banks have been known to offer dog biscuits at the drive through. Starbucks - Starbucks has a "Puppuccino". This is simply a small amount of whipped cream in a cup for your dog to enjoy. Dairy Queen - Dairy Queen also offers a "Pup Cup", which is a small cup of soft serve ice cream! Chick-Fil-A - Some Chick-Fil-A locations offer dog treats to pups that pass through. Dunkin' Donuts - Dunkin' Donuts offers treats, and some locations may offer puppy lattes, which are cups of whipped cream. Please note that dairy products may upset the tummies of some dogs, and you should ensure that your dog is not lactose intolerant prior to feeding them dairy-based treats like ice cream or whipped cream.